We have been a Sielox dealer since 1985 and 23-time National Dealer of the Year. ​Sielox provides integrated and complementary products and services and are innovative suppliers of card readers. ​The Fastlane Entrance Control range of products, which incorporates optical turnstiles, speedgates, barrier arm turnstiles, passgates, tripods and tailgate detection devices is designed to balance the needs of aesthetics, security, ease of use and flow rates demanded by today's modern entrance environment. ​Boon Edam provides access gates, full height turnstiles, optical turnstiles, revolving doors, security doors & portals, services & training, and tripod turnstiles. 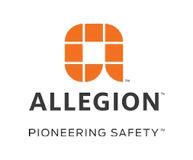 Allegion specializes in door closers, exit devices, steel doors and door frames.